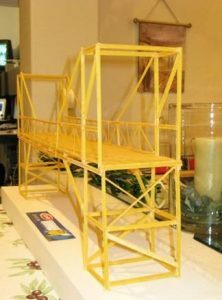 Richard first came up with the idea of constructing a bridge using fettuccine pasta, while pushing a shopping cart alongside his wife, Carmy, at a supermarket. As Carla stopped in the aisle stacked with a variety of pastas, Richard carefully observed the different types of pastas, appreciating the uniformity inside of the packaging. He recalls thinking, “To try and make something like that would be very difficult to say the least. 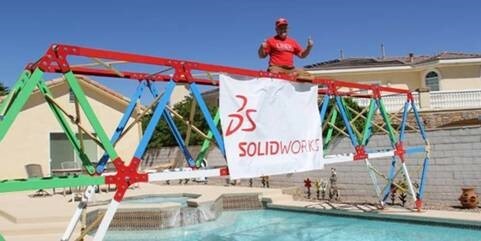 I could not wait to get SOLIDWORKS up and running when I got back home”. He started with a box of Barilla fettuccine pasta, where he measured some of the struts with a micrometer. He noted that they were very close in dimensions to each other. Next, he started to model those struts. During the process, he realized that these struts were very brittle and broke rather easily. However, he also knew that they were not meant to be used as building materials. 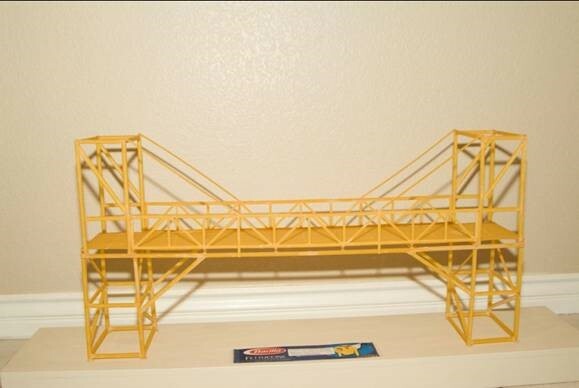 About 2 ½ months later, Richard had designed and constructed a 32 inches long by 16 inches high and 6 inches wide bridge made of pasta, consisting of three struts in an I-Beam configuration, and glued together with Elmer’s Wood Glue. He remarks, “when fettuccine pasta and Elmer’s Wood Glue are used (sparingly), the pasta becomes really very strong. 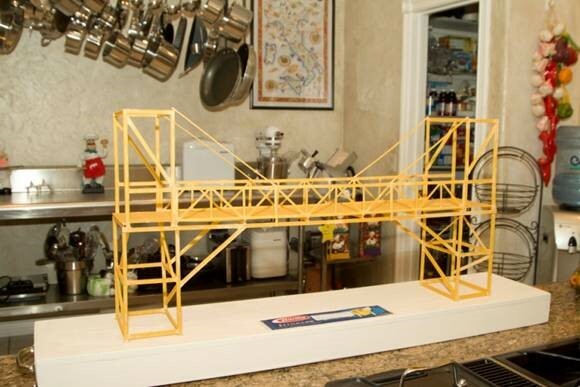 This I-Beam configuration made the Fettuccine Pasta Bridge very possible”. His article received much acclaim on the internet, and he received requests from various universities around the world to share more information about use of pasta in his design. 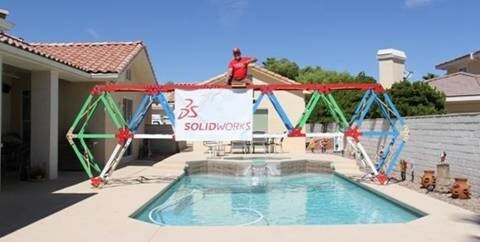 A PhD in mechanical engineering, in Switzerland, ran an Finite Element Analysis (FEA) study on the data and bridge design shared by Richard, and inferred that the bridge could support about 7 lbs. of weight at mid span. “Remember this is Pasta which is very brittle and breaks easily. Needless to say I was elated over this news”, Richard exclaims. Eventually, he donated the bridge to the engineering museum at the local university upon request. He shares, “I’ve made big bridges that I actually climbed on top of and they were so popular I had to make 4 of them to date”. 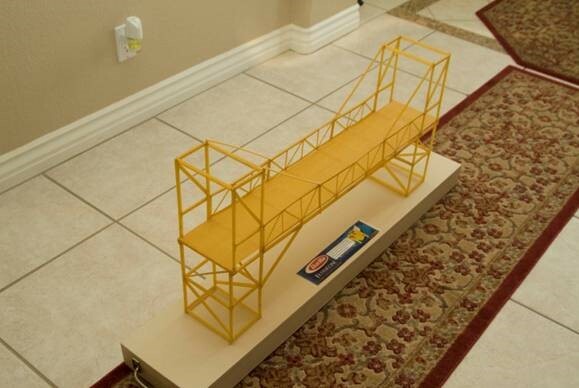 Each of these bridges is 26 feet long, 8′ 2″ high and 34″ wide, and made with lumber, weighing 154 lbs including hardware. In this picture, Richard is sitting on a seat supported at mid span, adding 177 lbs in weight. Find detailed article here. 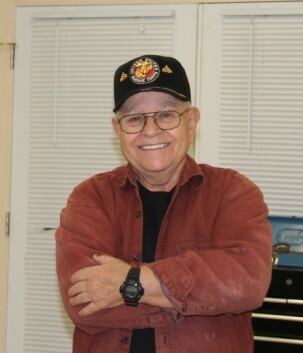 “I have one of these pictures hung up on the wall of my classroom at the College of Southern Nevada to show my students and any visitors that come in.”, he continues, “I cannot estimate how many hours of sleep I have lost over the years since the SolidWorks Corporation in Boston, Massachusetts allowed me to use their program to learn with. In particular, Mrs. Marie Planchard, the World Wide Educational Director of the company believed in me. Since that trust was placed in me, I seem to get most of my ideas late at night while in bed when I should be sleeping. That idea won’t let me fall asleep until I get up, turn on my computer and digitize my dream“. Continue to read the multiple part blog series to learn more about the projects by Richard Williams.